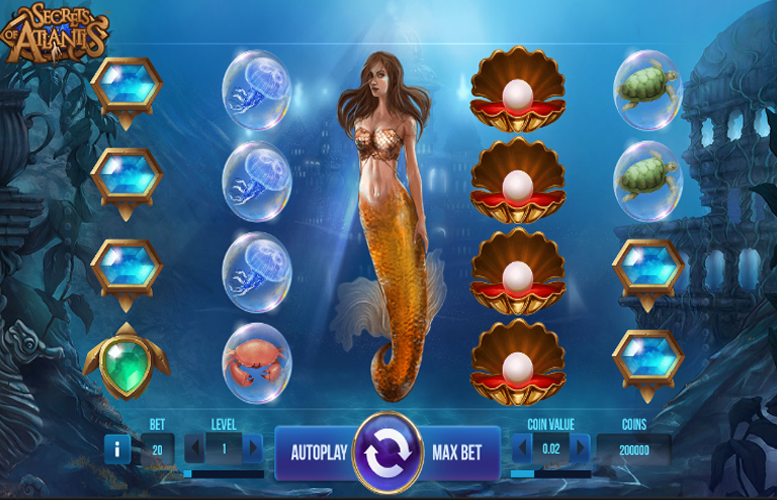 Take a trip down to the briny deep on the Secrets of Atlantis slot machine from Netent. The title looks the part and a glance at its return-to-player rating will be enough to win it some fans. However, it’s somewhat lacking in the feature department. We’d have liked to have seen at least a free spin mode or another second screen bonus. In terms of specifics, Secrets of Atlantis is played across 40 win lines and on a five by four gameboard. Curiously, however, when it comes to sizing bets, it’s played as if there were only 20 win lines. We’re really not sure why this is. Absolutely massive return-to-player rating. We’re not sure we’ve ever seen a slot offer players over 97% before. Secrets of Atlantis’ 97.1% could well be a first for us. Visually pleasing. The underwater theme gives the game’s artists scope to get creative and the results are tastefully delivered. Low main game prizes. Hitting five-of-a-kinds on Secrets of Atlantis isn’t nearly as exciting as it is on some machines. Limited features. Unfortunately, fans of slots with plenty of varied action are likely to be disappointed by this title. Oyster = 400x the line bet. Crab Ruby = 70x the line bet. Turtle Emerald = 60x the line bet. Jellyfish Sapphire = 50x the line bet. During every spin, the Highlight feature randomly highlights positions on reels two, three, and four. If the Highlighted positions completely cover reels two, three, and four at the end of a spin, a Colossal Symbols Re-Spin is activated. During a Colossal Symbols Re-Spin, reel two, three, and four transform into one reel with Colossal Symbols. A Colossal Symbol is a symbol block of three by four symbols and it can appear in Colossal Symbols Re-Spins only. Colossal Symbols will be fully or partially displayed depending on how the reel lands. The Colossal Symbol will always be fully displayed on the row. If the reel with the Colossal Symbol is fully highlighted, an additional re-spin is activated. When a Colossal Nudge Wild lands partially on the reels during a Colossal Symbols Re-Spin, the Colossal Nudge Wild is nudged up or down covering the whole reel. 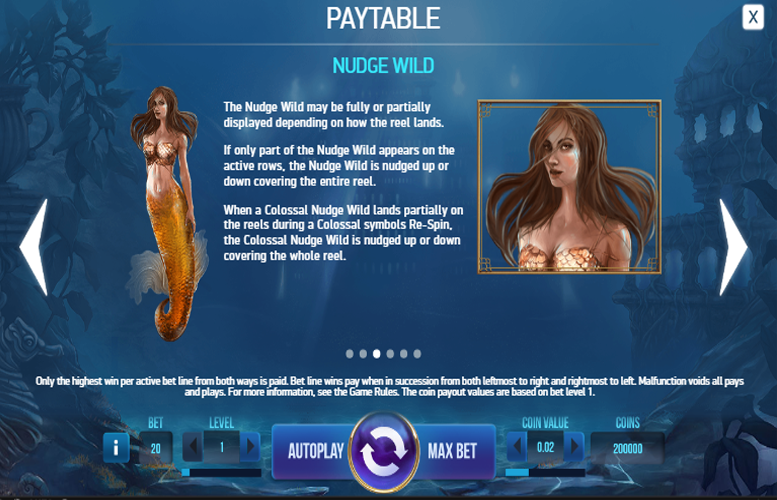 The game’s Nudge Wild symbol is represented by a stacked mermaid. She may be fully or partially displayed depending on how the reel lands. If only part of the of the symbol appears on the active rows, the Nudge Wild is nudged up or down to cover the entire reels. When a Colossal Nudge Wild lands partially on the reels during a Colossal symbols re-spin, the Colossal Nudge Wild is nudged up or down covering the whole reel. In addition to the game’s higher value symbols, there are also those that don’t pay quite so well. These are represented by various creatures of the deep ocean: a crab, turtle, and jellyfish. They’re all worth the same in terms of prizes – 15x the line bet. Like their higher value counterparts, these payments are disappointingly low. The number of win lines on the Secrets of Atlantis slot machine are fixed at 40. However, strangely, the game plays like there are 20. 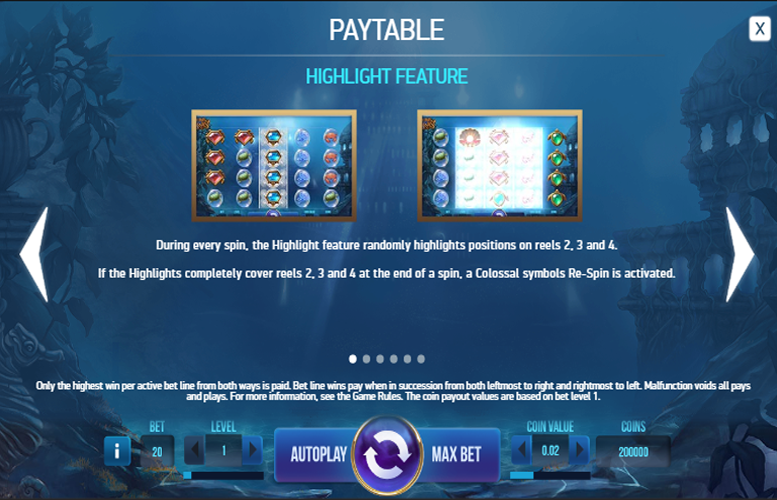 This means that players are only able to adjust the value of the coins they use to bet, along with the number of each they choose to wage on each of the 20 assumed lines. The highest and lowest values are £1 and 1p respectively. 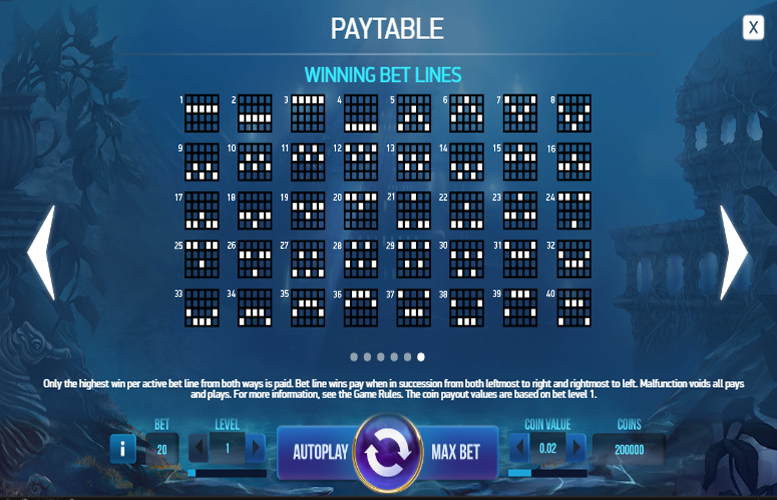 Meanwhile, players can bet between one and ten coins per line. This means, with all values set to their minimum, the lowest possible bet per spin is just 20p. Meanwhile, with everything maxed out, the largest bet per spin is £200. Whilst this might not be sufficient for the very highest rollers around, most players will find it more than accommodating. Whilst Secrets of Atlantis is certainly an excellent game to spin through a bonus on and not half bad in the looks department, those who are used to multiple bonus features might find that it gets dull quickly. The low main game prizes and lack of side games severely impact on the replay value of the machine. Despite these factors negatively impacting upon its overall score, the game is absolutely ideal for those seeking the highest RTP ratings around.